The Alumni Association extends an invitation to the Webster community to join them on Wednesday, Dec. 5, for their annual Holiday Concert. 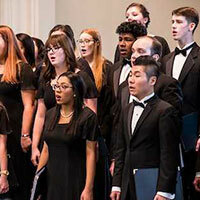 Again this year, the concert will take place on campus in the Winifred Moore Auditorium at 12:15 p.m., followed by refreshments in the Webster Groves Room. 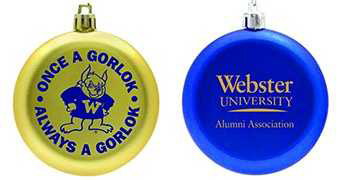 Alumni, Faculty, Staff and friends who have made a donation between June 1 – Dec. 1 will receive a limited edition Gorlok or Alumni Ornament at the concert as a thank you for your support of Webster. The Webster University Concert Choir, conducted by Dr. Trent Patterson, and Webster University Aurelia (previously named the Women’s Chorale), conducted by Dr. Stuart Hill, will each perform a preview of their holiday concerts that will be held at 7 p.m. on Saturday, Dec. 8 at the Cathedral of Saint Peter in Belleville, and on Sunday, Dec 9 at 3 p.m. at the Christ Church Cathedral in Downtown St. Louis. Those interested in attending should RSVP here.